← Its the little things..
Shout out to Mr. Rogers! I used to love that show. Even the creepy puppet people.. I woke up bright and early this morning to sun shining through my windows. I get up around 6:30 naturally every day and I LOVE it. When I’m up at school, my roommates are still asleep and when I’m at home, the rest of my family is still asleep, so I get to make and eat breakfast and enjoy the peace and quiet for a bit before starting my day. 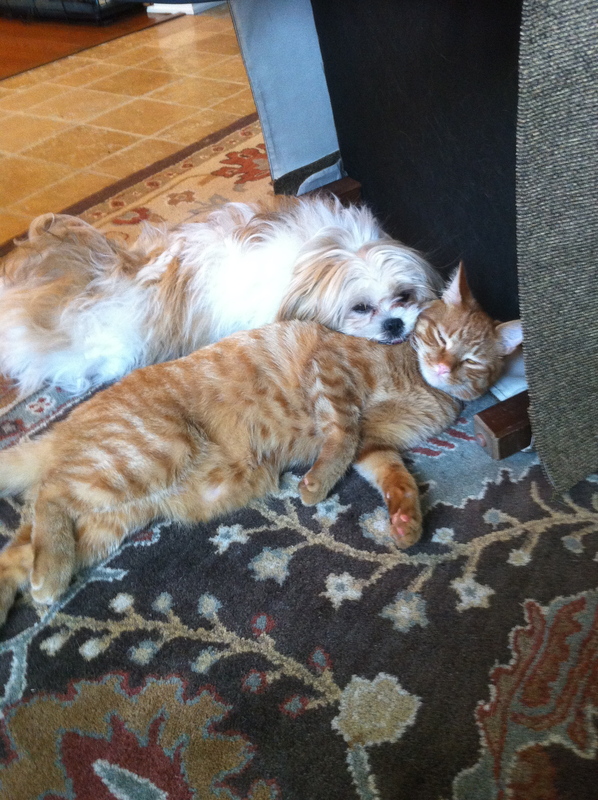 The boys: My moms puppy named Palmer and my cat named Igor. They're the best of friends. Its adorbs. Went down stairs, put on a pot of SUPA strong coffee and immediately got to work on breakfast. Brace yourselves.. Its different today! 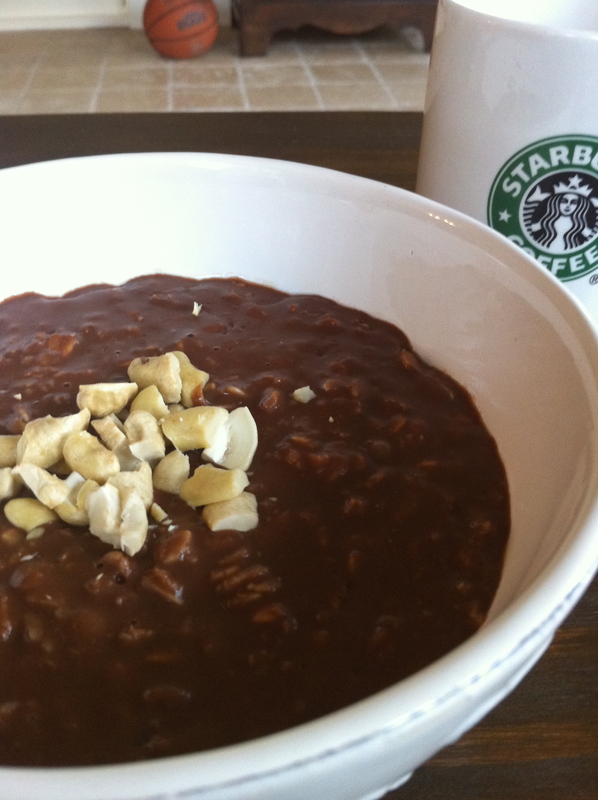 Chocolate banana oats with cashews. Scarfed in warp speed immediately after this picture was snapped. As I scarfed my dessert, er, breakfast, I pondered what I wanted to do for a morning sweat sesh. I opted for some biking around town. We have some killer hills around my parents city so I definitely got a great lower body + cardio workout. 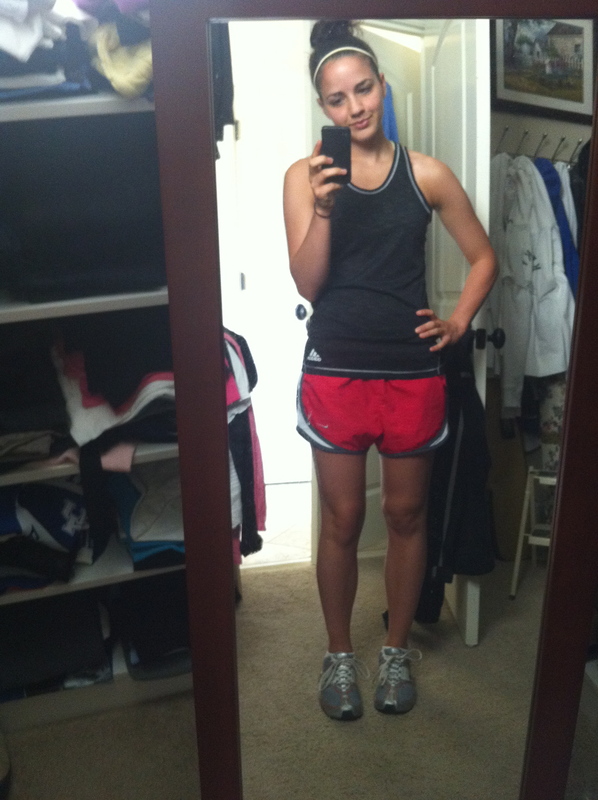 The usual workout garb. Dri fit saves my life when I'm in the south. Fo realz. I lunched, got clean, and lounged by the pool with a nice book. Insert large amounts of snackage including another one of those delicious Alvarado St. Bakery sprouted wheat bagels + cream cheese + some cheese and crackers (I could live off of carbs and cheese alone. Fact. )+ handfuls of cashews. Are you more of a snacker or a “three square meals per day” kind of person? Normally I’m in between and eat three main meals and three or so snacks. Seriously a good idea! I live in the middle of nowhere and all roads seem to lead into each other- no good for biking= boring. I’ll try it though, eventually. Thanks for your great stance on “food is fuel”! I’m glad someone thinks this way- go eat those bagels and cheese!! I wish I felt brave enough to do so. I tend to eat breakfast, lunch and dinner and then have mini snacks if I feel hungry. Lately I’ve taken to a protein shake around 3 because it holds me over until dinner. I’m so happy that I am honestly able to see food as fuel now. It makes it so much less intimidating. I was once where you are right now, and I know you will be able to do this one day too! :) And I definitely feel you on the siblings.. They can be a handful! i eat 3 square meals PLUS lots of snacks. i try not to focus too much on trying to figure out how many times i eat per day – i know i need to eat my three meals and if im hungry in between, at any point, i’ll just eat and roll with it. this past year has been a lot about trusting my own body, and as a result im a LOT happier and have a lot more energy to focus on… life! I totally agree! I used to not be comfortable with trusting myself, but now that I do, I don’t constantly think about it and its so liberating! I totally agree with you two! I’m still in the phase of figuring out what’s right and how to truly listen to my body though, but will hopefully find the perfect balance soon! It should be so easy, right!? Over the years, we are pelted with the message of “less is more” and thats just not true! Exactly! We have to treat them right so they will work like we want them too!